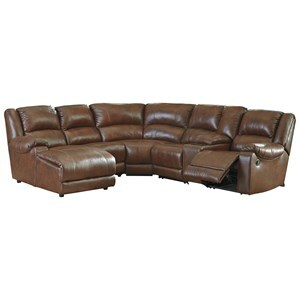 Settle into the luxurious comfort of this reclining sectional with leather match upholstery. 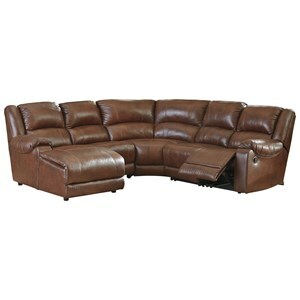 It offers 100% top-grain leather in the seating areas with faux leather at the sides. For seating, it includes a Zero Wall Recliner, armless recliner and stationary chaise. The armrest console offers a storage compartment. plus two cup holders. 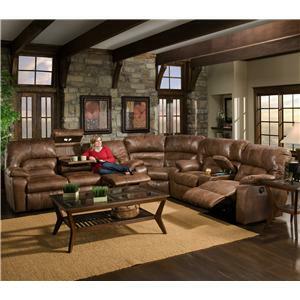 The Billwedge Leather Match Reclining Sectional with Right Chaise & Console by Signature Design by Ashley at VanDrie Home Furnishings in the Cadillac, Traverse City, Big Rapids, Houghton Lake and Northern Michigan area. Product availability may vary. Contact us for the most current availability on this product. 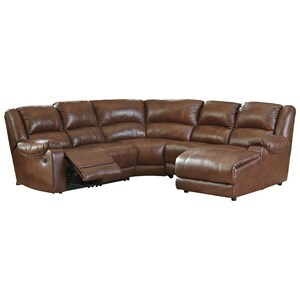 1940277 Wedge 1 71" 39" 40"
1940257 Console with Storage 1 14" 39" 40"
1940240 LAF Zero Wall Recliner 1 35" 39" 40"
1940219 Armless Recliner 1 25" 39" 40"
1940246 Armless Chair 1 25" 39" 40"
1940217 RAF Corner Chaise 1 34" 63" 40"
The Billwedge collection is a great option if you are looking for Casual furniture in the Cadillac, Traverse City, Big Rapids, Houghton Lake and Northern Michigan area. 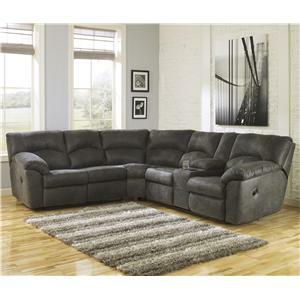 Browse other items in the Billwedge collection from VanDrie Home Furnishings in the Cadillac, Traverse City, Big Rapids, Houghton Lake and Northern Michigan area.